Getting together with old high school friends tonight and we’ll try to not talk about old track & field “injuries.” All-new post next Friday. Dad was that rarest of men: He didn’t watch ballgames or follow sports teams. He just wasn’t into it. Dad didn’t have a prediction, but did his best to politely respond. The only competitive bone in his body was against himself and what he could achieve. 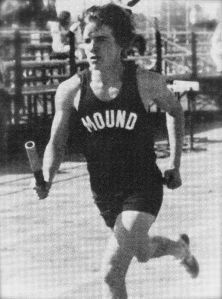 Likely taking a lead from Pop, I decided it was past due that I competed with myself—which in high school meant joining track. Not entirely sure how that began, given my normally bookish habits. I’ve always been somewhat kinetically challenged, a tendency toward clumsiness. So, sprinting didn’t feel right and long-distance running was too rigorous. Middle distance had the Goldilocks factor—just right. ~ by completelyinthedark on September 23, 2016.